With dismay I discovered that I did not have a full frontal "before" photo, but here are a few partial views of this home of dear friends and close neighbours. The last spring garden. 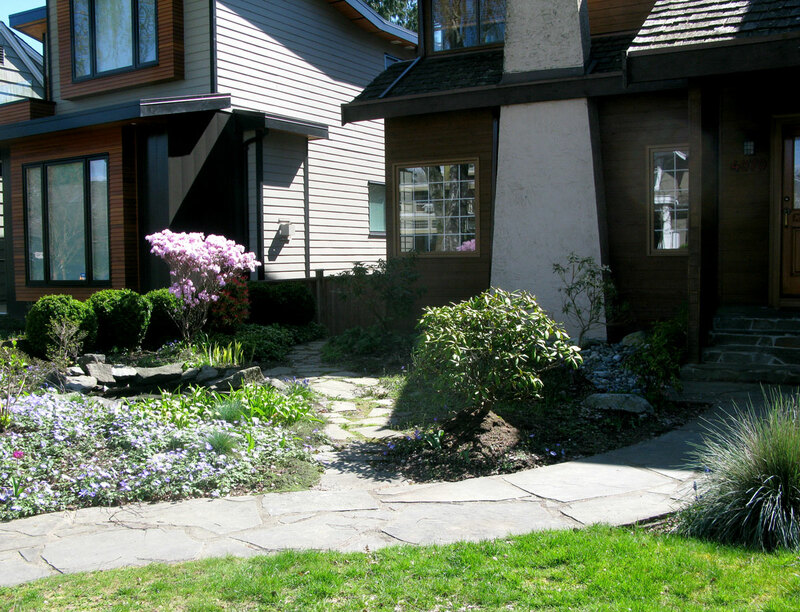 The garden was well designed and admired by everyone. 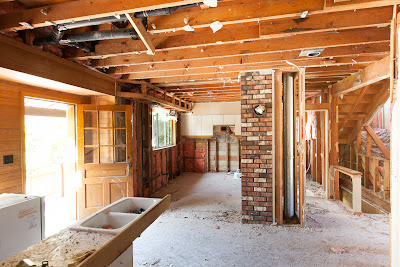 4064, the house to the east was torn down on July 18, 2011. 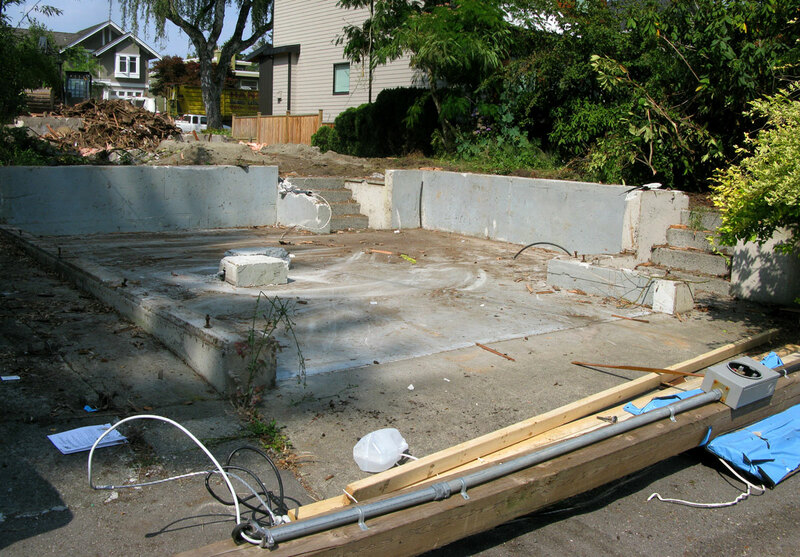 The beautiful pool and garden of 4070 remains serene while 4064 is being demolished in the background. 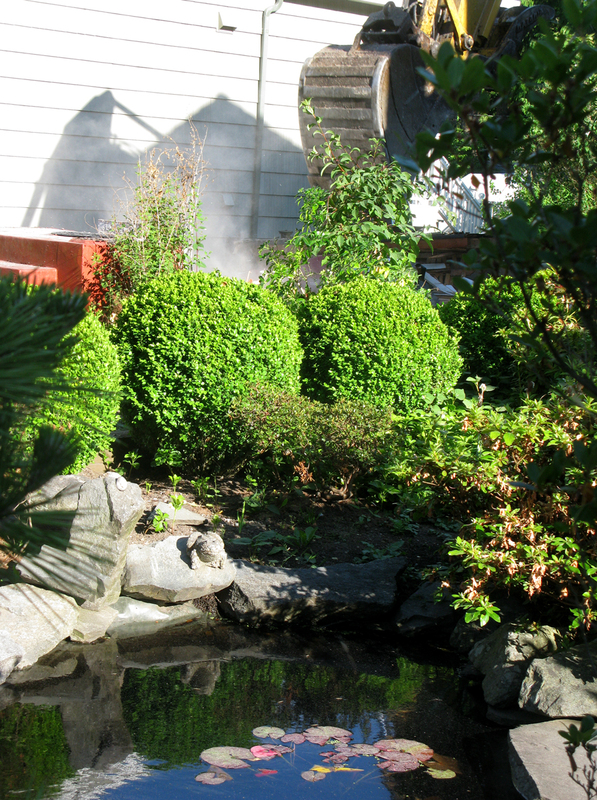 Neighbours transplanted many of the plants into their own gardens. The rear of the house, "before". 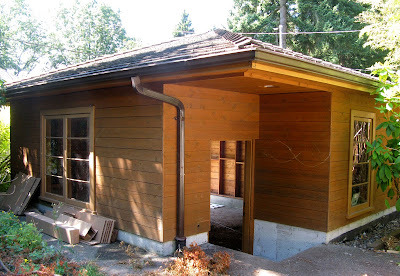 View of the garage from the back yard. Several neighbours would have loved to have this beautiful garage replace their own decrepit 1930's versions. 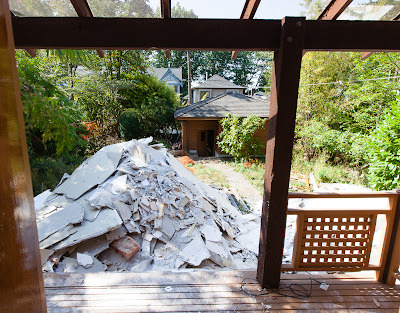 A view of the formerly lovely back garden. The excavator arrived shortly after 9:00 am. 10:58 Already the chimney is gone. 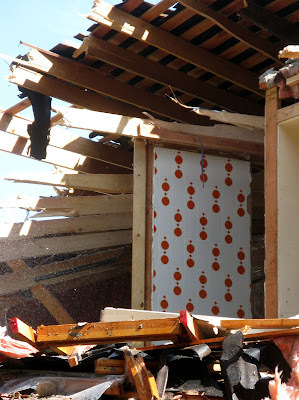 In case you didn't notice on the previous photo, the owners liked the colour orange! 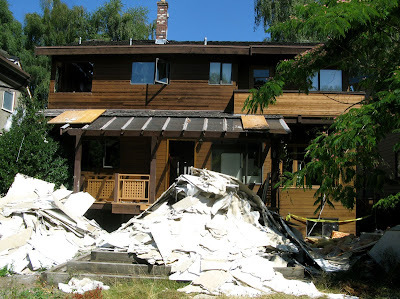 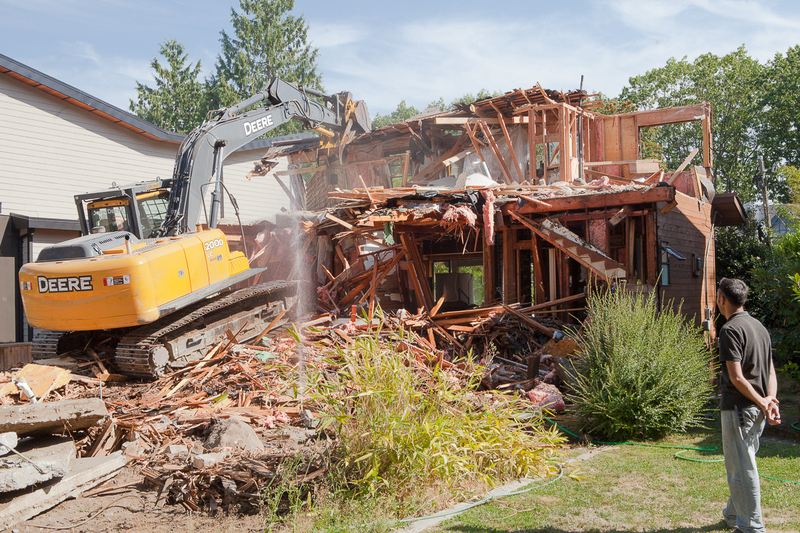 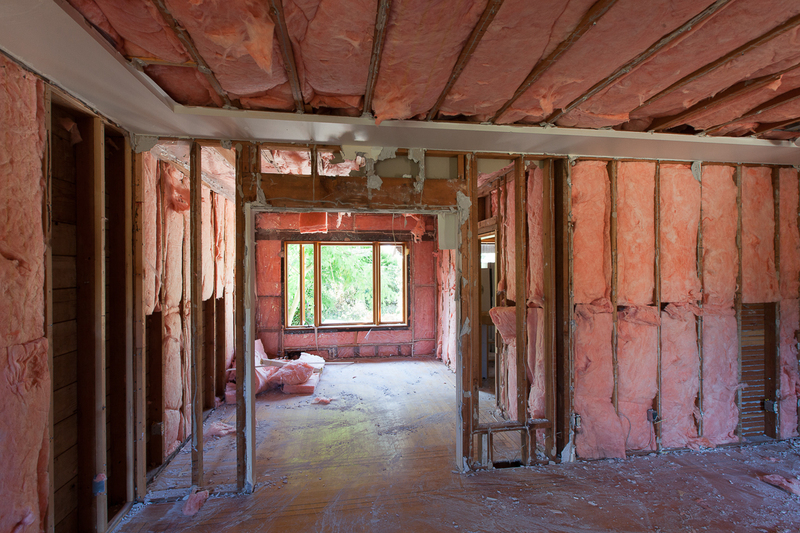 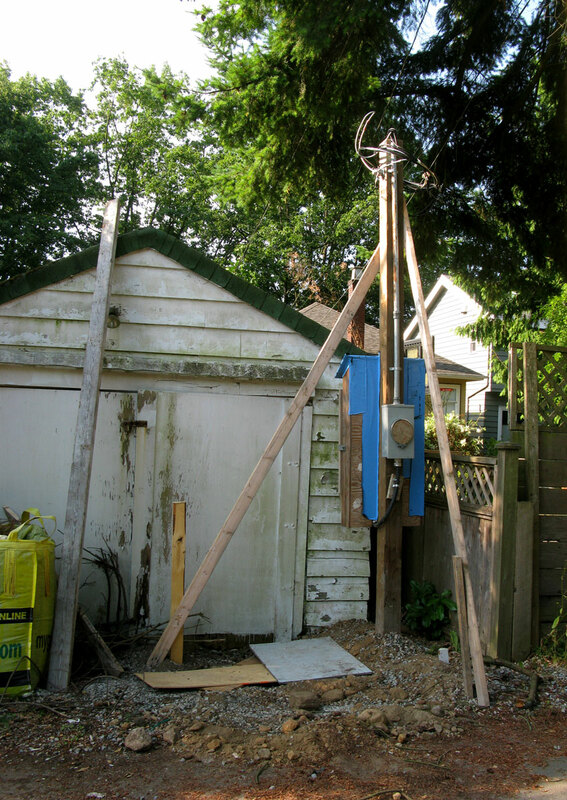 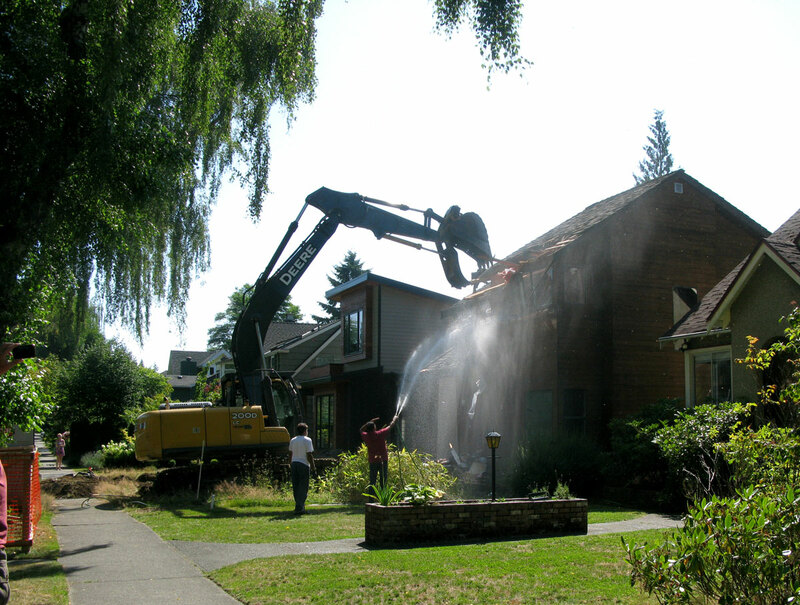 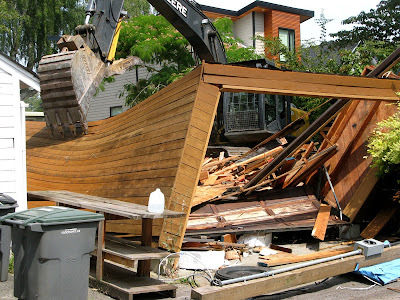 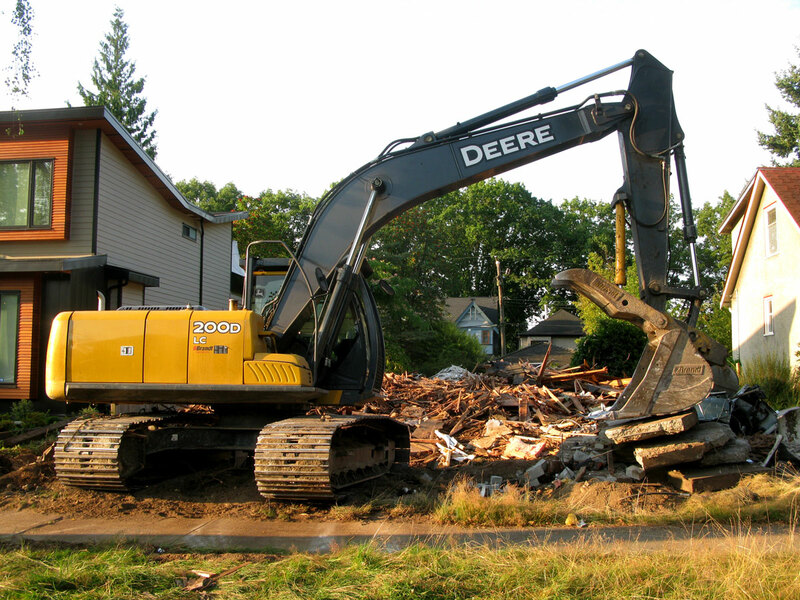 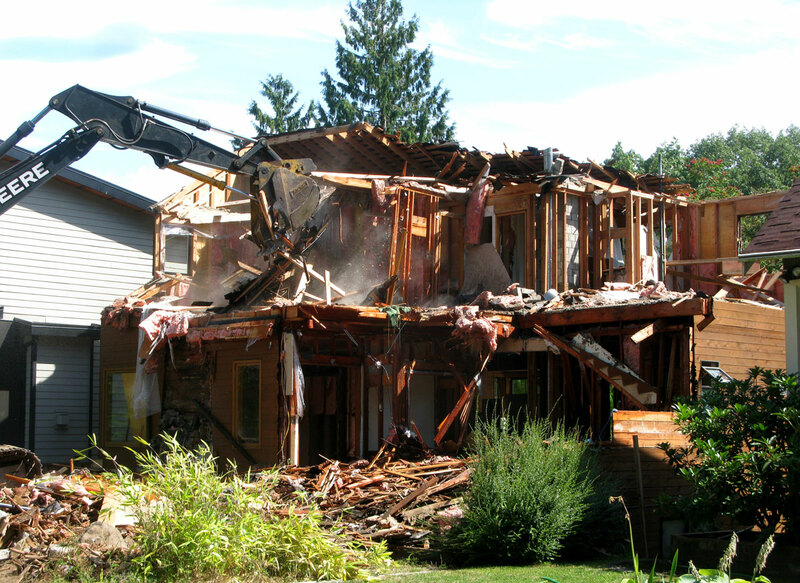 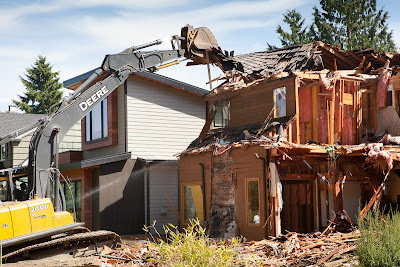 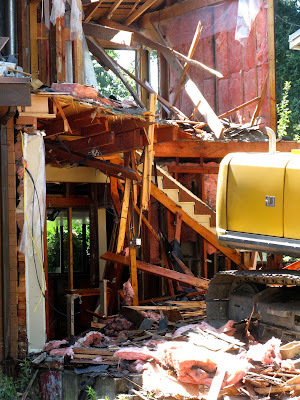 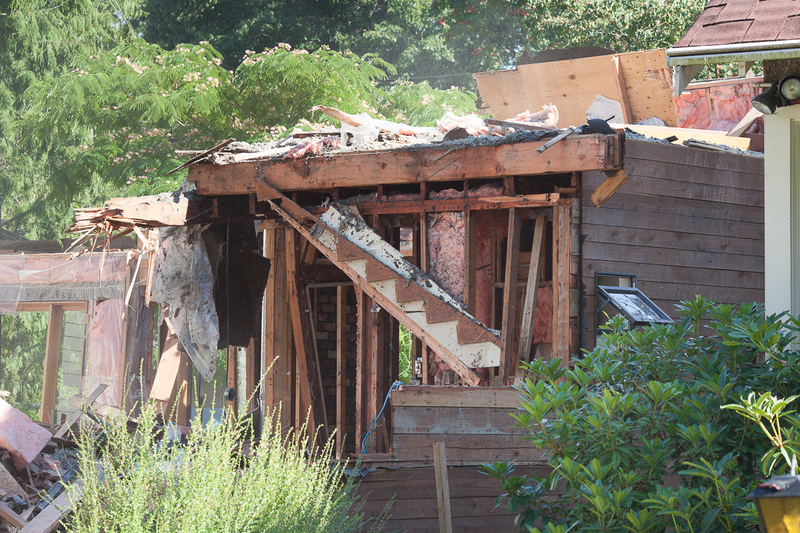 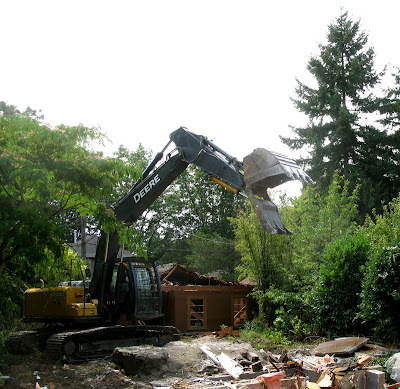 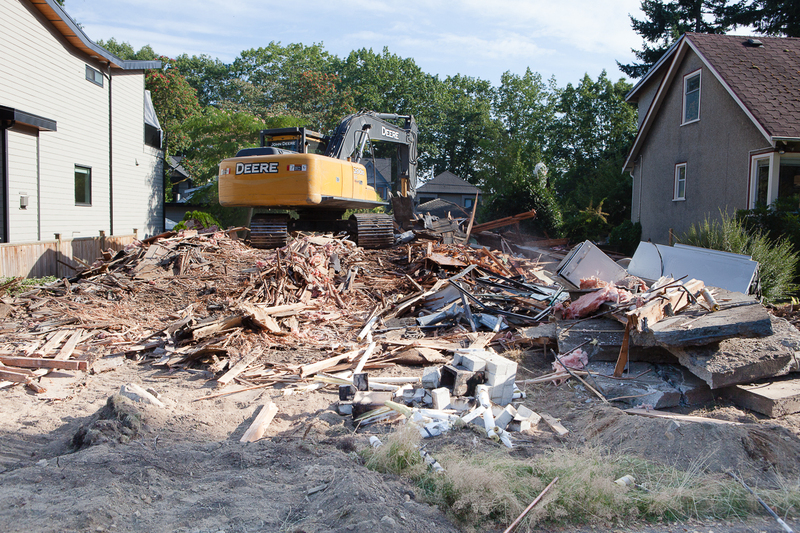 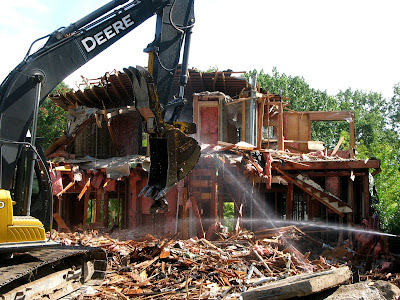 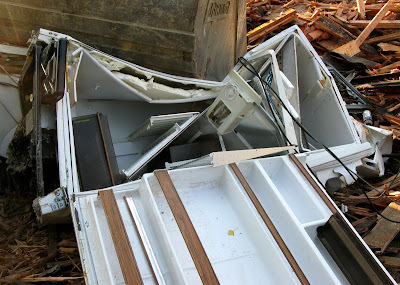 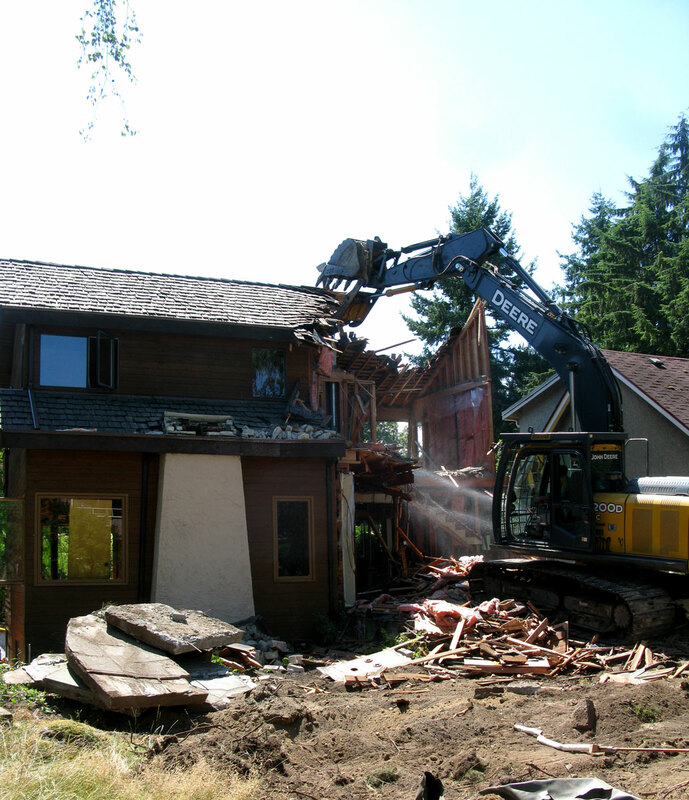 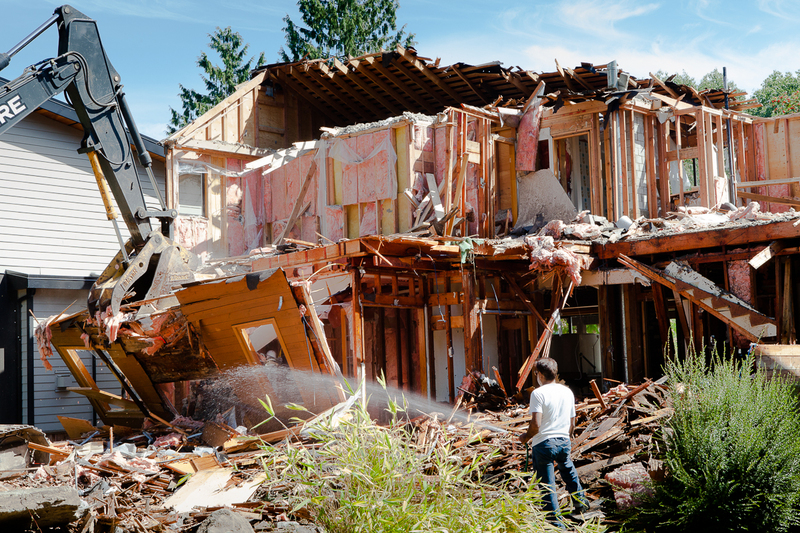 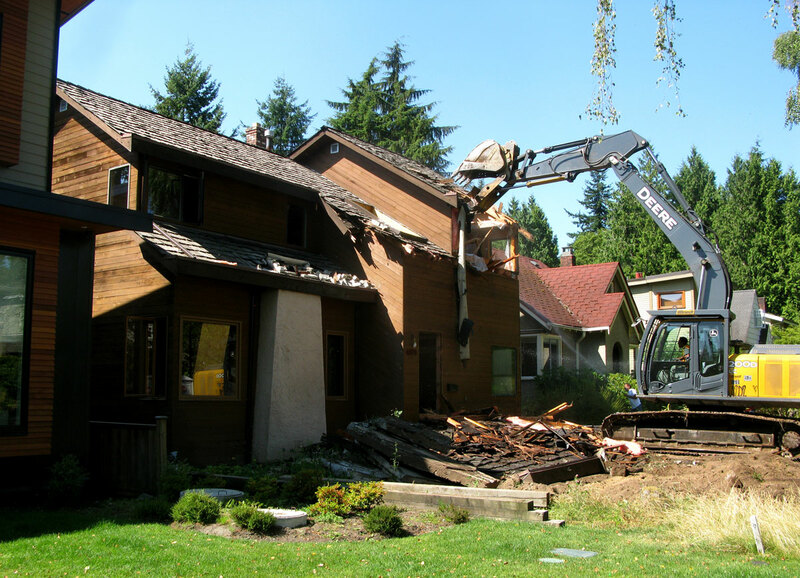 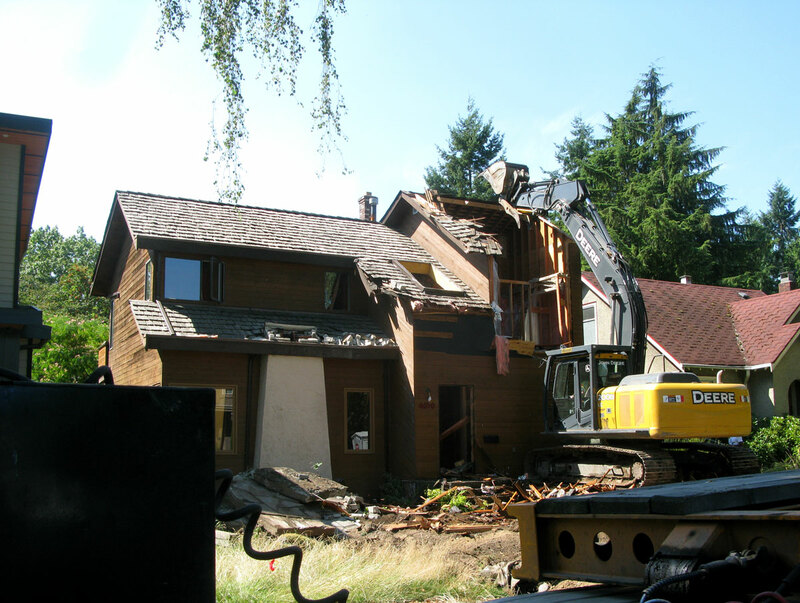 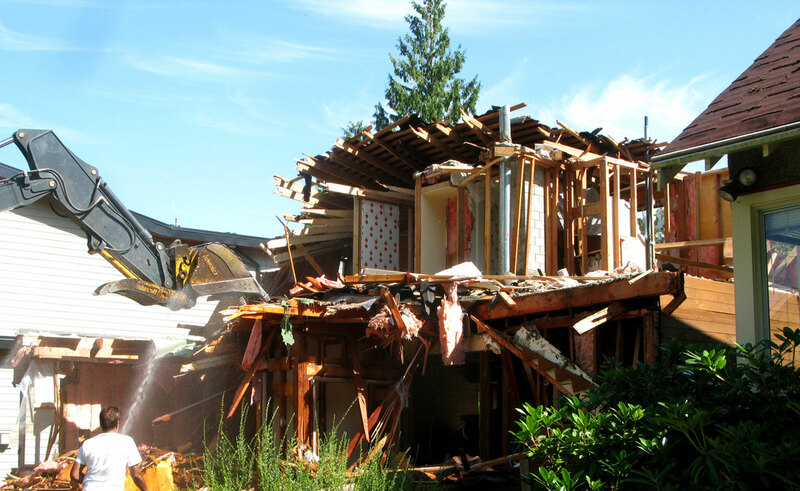 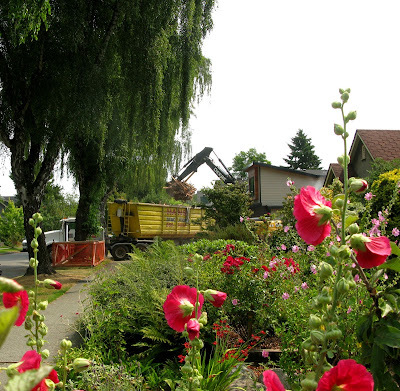 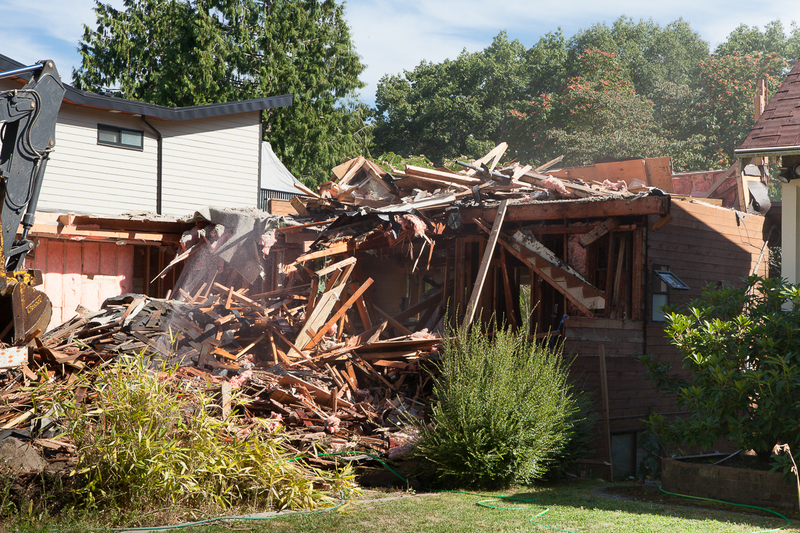 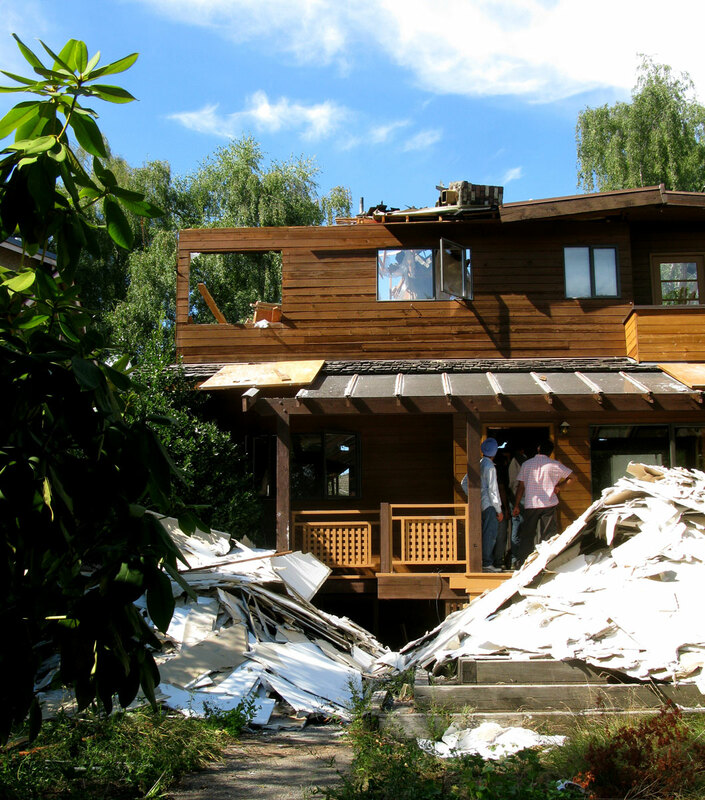 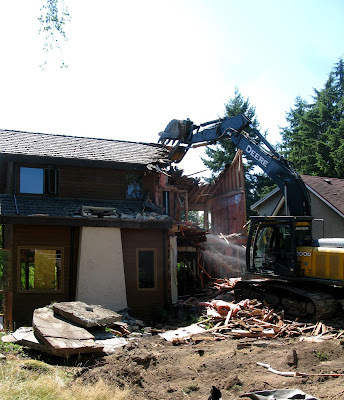 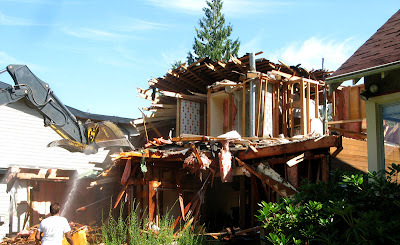 Of course we are aware that demolitions are not green, but some examples bring the situation to the fore, showing the massive contrast with the careful recycling every Vancouver household is supposed to do each week. 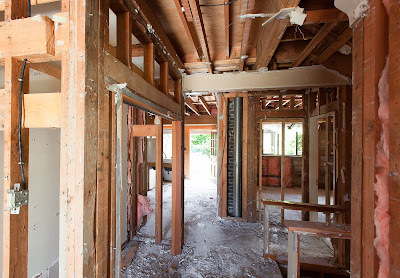 These three interior views without the drywall show the solid wood structure in this house, likely built in the late 1930's or early 1940's with a second storey added around 1980. 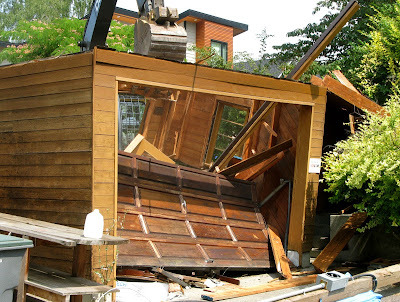 Along with being an expert gardener, the owner did excellent carpentry work. 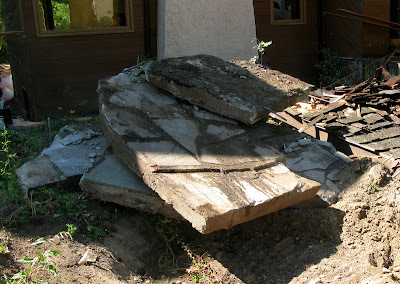 Neighbours took away most of the rocks around the pond and many other stones of various sizes to use in their own gardens, but this walkway was cemented together, so off to the landfill it goes. 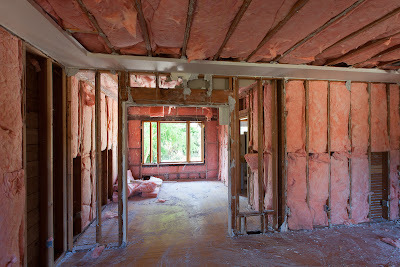 Do we need another picture of the pile of drywall that is headed for drywall purgatory? 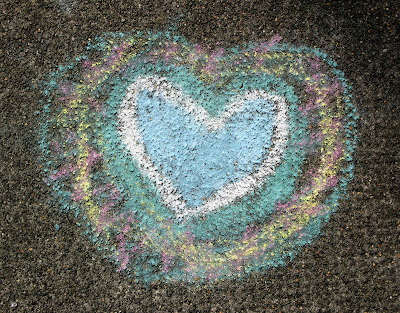 The neighbour children had to leave their place of sidewalk art due to poor air quality. 4070 does not appear to be the last demolition in the neighbourhood. 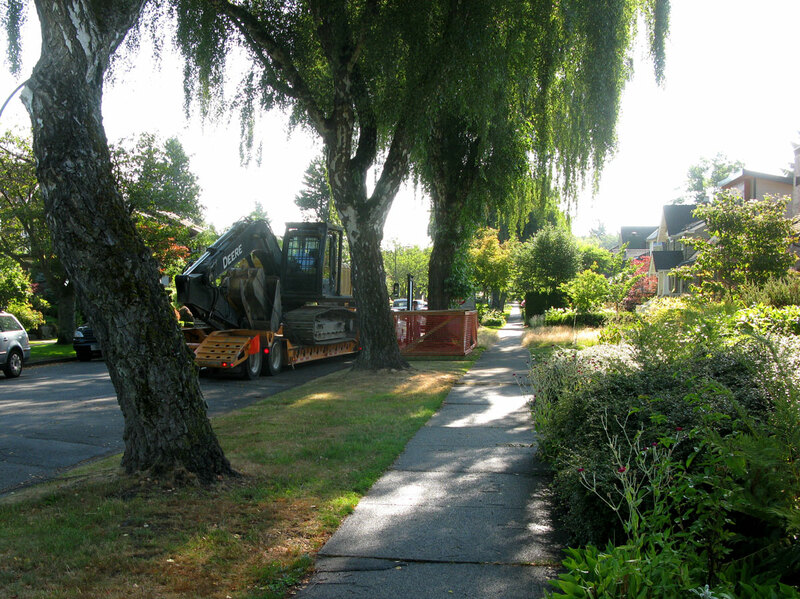 Later that same day, this took place across the lane. Why such a long blog? Because this was the home of friends, neighbours who were engaged with people on the block, helping others in various ways for 40 some years. 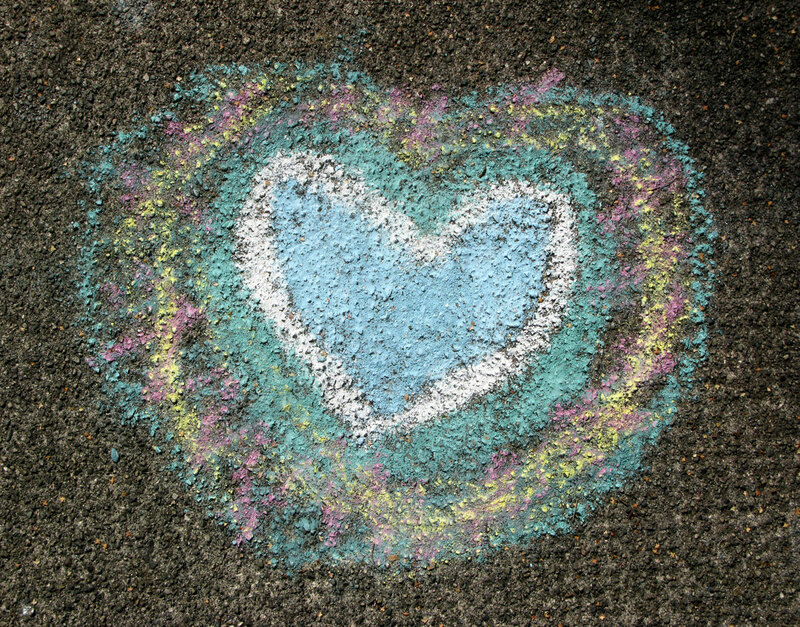 We all miss them! 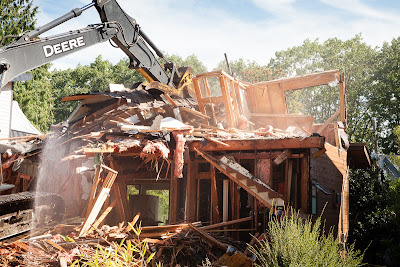 Credit goes to J. Evan Kreider who took some of these photos.